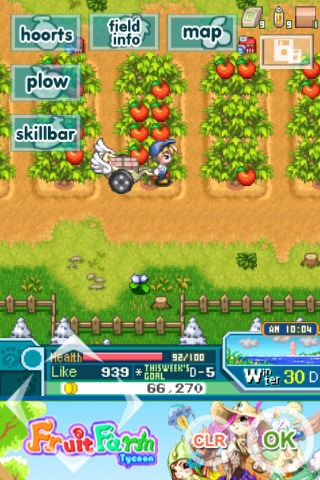 There are plenty of Farmville-type games available in the App Store, but it’s surprisingly difficult to find a decent Harvest Moon farming experience. It’s this niche Fruit Farm Tycoon looks to fill, and it does so reasonably well. A farming sim with a strong sense of story, Fruit Farm Tycoon, like its Harvest Moon inspiration, offers quite a bit beyond just tilling fields. You play as Leo, a carefree young lad who has responsibility suddenly thrust upon him when he is charged with growing a Heavenly Fruit by mysterious magical forces. To top it off, his father has been hospitalized and will be kicked out unless Leo can pay the regular bills. Leo has three years to keep the farm running, take care of his dad, and also grow the Heavenly Fruit. Farming works about how you’d expect. You prep the fields, plant seeds, and make sure they have enough fertilizer, pesticide, and water. There’s always weeding to be done, and you can even gather wild fruits if you like. In addition to the farming, there are a number of side activities, like fishing, raising pets, visiting town, and the biggie, getting a girlfriend. This is basically Harvest Moon’s entire schtick, so fans of the genre shouldn’t expect anything new, but Fruit Farm Tycoon does a reasonably good job of recreating this. The graphics and sound are very well suited to the game, with cheery looking sprites and appropriately bouncy music. The controls, however, take up a lot of real estate on the screen and make everything look extremely cluttered. Combined with an extremely long and confusing tutorial, you may be very bewildered by the control scheme, although you should be fine if you’re used to Harvest Moon games. It’s pretty clear from the start that this game would have strongly benefited from a fluent English-speaking proofreader, as the game is riddled with typos and translations errors, although you can usually figure out what’s being said. I suspect that this may also be a port of an older mobile game, as some of the menus have some odd, irrelevant instructions, like pushing 3 or # to continue, which doesn’t really affect the gameplay at all, but it did stand out as being a little strange. The game is extremely slow to start, and gameplay, as for any farming sim, tends to be rather repetitive, but there is always plenty to do. Harvest Moon fans will almost assuredly like this one, but even if you’re just a curious gamer, Fruit Farm Tycoon does have a lot to offer and is worth a look, but only if you’re the patient sort. AppSafari review of Fruit Farm Tycoon was written by Tracy Yonemoto on May 13th, 2010 and categorized under App Store, Games, Resource Management, RPG, Strategy, Time Management. Page viewed 5773 times, 1 so far today. Need help on using these apps? Please read the Help Page.